The Baladerry Inn has a rich history. The oldest section of the inn was constructed in 1812 on the Bushman Farm, with the rest of the main house added in 1830. The home was built as a tenant farmer’s house, and was later occupied by the son of George Bushman. Located on what is now known as Hospital Road, the Bushman Farm was a field hospital for the Army of the Potomac during the Battle of Gettysburg. Judy & Kenny Caudill are pleased to introduce themselves as the new owners of the Baladerry Inn Bed and Breakfast, having purchased the property in June of 2010. Their goal is to carry on the traditions that guests have grown to appreciate and to enhance the existing amenities in a manner that will exceed the expectations of both return guests and new visitors. Judy comes from the small town of Lineboro, in Carroll County, Maryland. She was raised in a typical family environment, with two brothers and one sister. Growing up, she and her siblings made mud pies, rode tractors, and played school. Later in life, Judy worked at Sweetheart Cup Corporation and later built and managed her own cleaning business. Her interests include scrapbooking, camping, reading, cooking, gardening, and business management. Kenny is from Maryland’s Anne Arundel County, moving with his family to Carroll County in his teen years. He has one brother and two sisters. Kenny worked as a machinist for 10 years prior to being employed by the Utz Potato Chip Corporation. His interests include hunting, camping, gardening, maintenance, and business management. 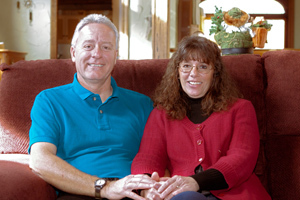 Kenny and Judy met in high school and became husband and wife in 1990. They have one child and two grandchildren. They are members of Lazarus United Church of Christ in Lineboro, Maryland. Together, they owned and operated Round Top Campground, in Gettysburg, for 7 years. More recently, they spent several years travelling across the country, then settling down to work for Camp Eder, in Fairfield, Pennsylvania while seeking out their next adventure. Kenny and Judy found the Baladerry Inn and knew that this was the adventure they sought. The Baladerry Inn is in a quaint and quiet rural setting. They love people and look forward to welcoming guests into their family circle. Ballie the cat is a new addition at the Inn; however, she stays off the furniture and out of the guest rooms. Kenny, Judy, and Ballie would like the Baladerry Inn to become a special place in the hearts of their guests. They plan to continue and expand upon the inn’s tradition of presenting special events and hope to make the inn a true destination for special occasions. Together with their guests, Kenny and Judy hope to build special memories that will last a lifetime.